It was once thought that the field of genomics would give us final insights into the intimate mechanisms of how organisms function. However, the charting of genomes only provided additional questions and mysteries. DNA functions as the "blue print" for an organism, but not all components of this blue print come into existence- the proteins that are produced from this blue print depend largely on the organism's state of being and environment. Thus the field of "Proteomics" was born. But one can go even farther, and examine the metabolites (the small molecules that result from metabolism), which gives one insights to exactly what is happening inside an organism at an exact time in space-cue the field of "Metabolomics". Visiting Ph.D. candidate Maggie Sogin came to Kalaupapa to collect samples of coral for her research. She is examining the different metabolite concentrations among corals that are more robust to environmental stressors, with the goal of furthering understanding of how corals will respond to future conditions of climate change. 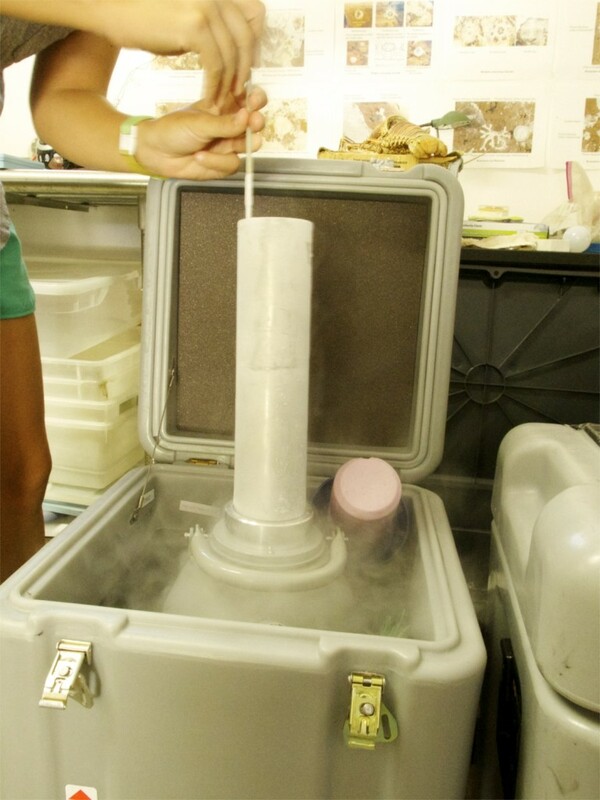 Samples are "snap frozen" in liquid nitrogen for further NMR (Nuclear Magnetic Resonance) analysis. For more info, visit the Gates Lab.